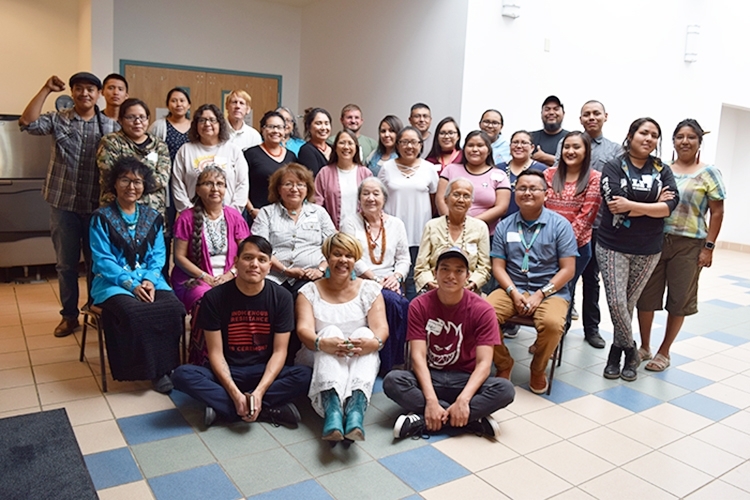 On July 13th to July 14th, I participated in the Emerging Diné Writers’ Institute in Crownpoint, NM. 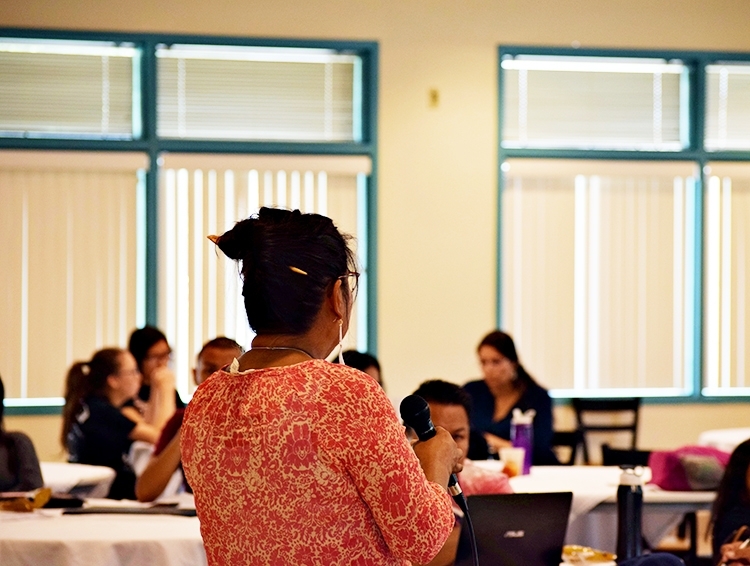 The institute was co-sponsored by the Navajo Women’s Commission and Navajo Technical University and took place at NTU’s main Crownpoint campus. 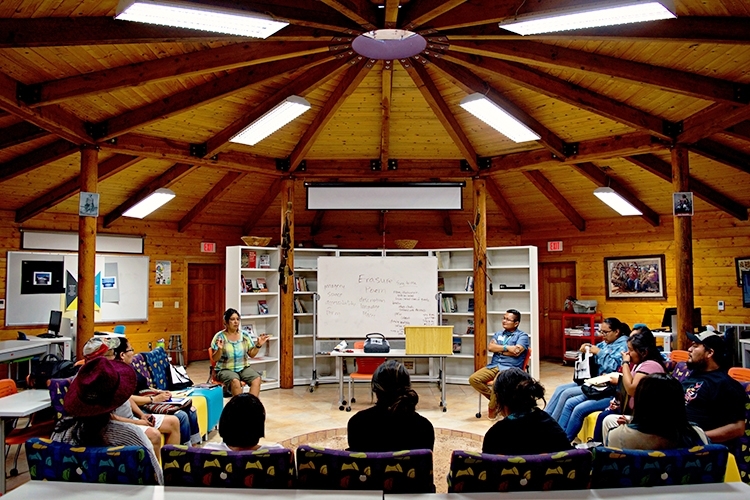 The institute was created for Diné individuals interested in starting or advancing in the field of creative writing. 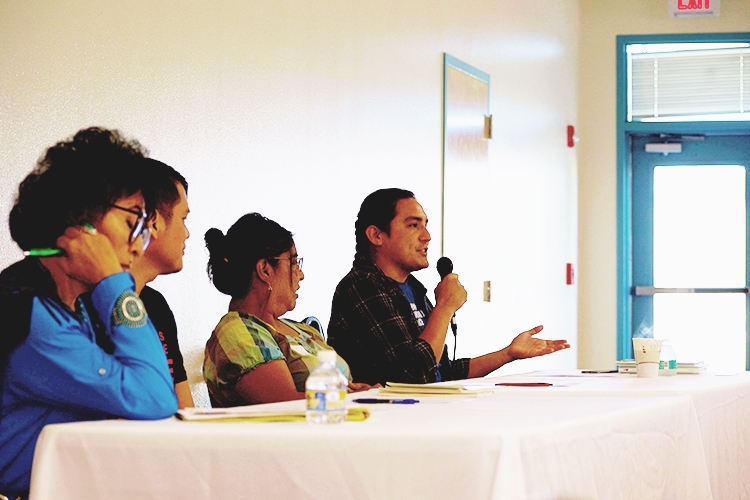 It was really to address the missing voices of Diné writers where our culture is often both under-represented and mis-represented in the publishing world. Attendees included current college students and high school students referred to as the "writing scholars" but the institute was open for any individual willing to come learn more. I myself am attending Northern Arizona University for English Literature and hope to pursue some sort of creative writing MFAs, write some stories, and screenplays some day. The institute was riddled with author panels, instructional and informational powerpoints on writing, how to get published, and an open mic where attendees would share their own original works. The afternoons were filled with breakout sessions led by the authors presenting their area of expertise, these genres included graphic novel writing, short story writing, children’s books, multiple storytelling, one-word poems, memoir writing, and flash fiction. I was encouraged to attend this event not only as a student interested in creative writing, but also as an employee of Salina Bookshelf (we joked that the institute was my form of workplace training so I could write awesome stuff for the company…like this blog). LaFrenda Frank, Salina Bookshelf’s editor and I drove from Flagstaff to Crownpoint as she was one of the presenters for the institute. Many writing scholars arrived on Wednesday evening, July 12th and checked in at the NTU dorms, it was really our home for the next few nights. After complimentary dinner on the first check-in on Wednesday (shout out to NTU for feeding us for three days), we met for the first time at a small Hogan located next to the dorms where we would begin our first writing exercise led by Lemanuel Loley, NTU’s Job Placement Coordinator and adjunct faculty in NTU’s School of Arts & Humanities. Lemanuel led us on a nature writing exercise in which we climbed to the top of a mountain that overlooks all of Crownpoint where we read from Irvine Morris’s From the Glittering World. We noted how Morris used storytelling to describe a location or monument rather than relying completely on physical description. We wrote for about fifteen minutes, in which time I looked out onto the beautiful landscape with my legs dangling off a cliff while I heard children laughing and screaming with birds constantly chirping like they were talking back to each other. Crownpoint, to me at least with what little I was able to see during my stay, is quite small. I made a note at how very few cars I saw operating on the roads, usually silver or white cars with maybe one truck. I saw NTU employees leaving in silence from the buildings they spent the whole day in, imagining them exhausted but excited to head home to wherever they drove from. I noticed the other writing scholars crossed legged, standing, sitting with legs stretched out, hunched over their yellow notebook pads provided by the institute writing, thinking, and breathing. Volunteers were asked to read their work but I believe I completely misunderstood the assignment as I wrote random small phrases of what I saw, heard, assumed, smelt, and thought while others were reciting these beautifully constructed poems. A little embarrassed I decided not to share mine at the moment but I will share a few phrases that I could actually make out from my terrible handwriting. a single kid yelling to no one even in sight"
There was an old white truck I saw, a few cars, a sad looking crate that was fenced in (like how did it get there? who stood him up? poor lonely freight crate with no date) and the only sounds I heard were kids in the distance with birds talking everywhere all being interfered by the wind which reminded me of the sound you hear when someone hits you in the head with a pillow. We returned to the hogan hot and greasy ready for the next exercise. We were introduced to Diné writer and multimedia artist, Esther Belin, who led us into a Terence Hayes inspired writing session in which we were to choose a word from a list of words and phrases that dealt with Navajo Nation treaties. We were to take this chosen word and come up with more words that consisted only of the same letters found in that word. We were then to write sentences that ended in these words we came up with in order to make a poem. Here is mine. I really enjoyed this writing activity because it allows the writer to study a word, like Ganado Mucho, and mend it into meaning, causing us to stretch our brain muscles to be creative (I had to refer to the dictionary/thesaurus the institute provided for us in order to find words like "gaud" and "goad"). I chose Ganado Mucho because I’ve constantly heard the name over the years and it always stuck with how awesome it sounds. I imagined the image of a Navajo child surrounded by non-natives at an exhibit where a Hogan is displayed along with a figurine of historic Navajo individuals. The idea of Natives being seeing as “exotic” or used as a showcase in museums made me think about the actual sacrifices our ancestors have made in order for us to enjoy the simple luxury of being able to visit a museum, to hum, to breathe as a free individual. I met individuals who had little knowledge to no idea about true Native American history which gave me the idea that museum displays are the only source they read when learning about such history. I also like to rhyme whenever I can...man. A huge, and I think the most exhilarating, part about every exercise was the sharing with the other writing scholars. Hearing my own words jump off the page, into my mouth, and back out into the world is uncomfortable, embarrassing, but overall important as it relieved a lot of tension built upside me from the ideas and emotions it took to write certain pieces. Hearing other individuals offer up their imagination as sacrifice to others to feed off of was also incredibly empowering. It's always nice to be brave enough to release our own work into the world but I started to realize how important it's always been to listen to others, like really pause and listen to what other individual's have to express. We ended the night and as I returned back to my dorm room I started to realize how much I needed to be there amongst fellow Diné students. That Thursday morning, the institute kicked off with opening prayers, introductions, and shared excitement. The attendees were treated to a Diné author panel including Roberta John (Red is Beautiful, Proud to be a Blacksheep), Orlando White (LETTERRS, Bone Light), Esther Belin (From the Belly of My Beauty), and Daniel Vandever (Fall in Line, Holden!). Roberta John and Daniel Vandever, both of their books are published by Salina Bookshelf, explained writing their books, how they found Salina, and working with the editor to shape the final product of their children’s picture books. Esther Belin and Orlando White offered some suggestions about poetry writing in less traditional, more experimental styles. Though each author had completely different experiences a common theme was prevalent. A theme of Diné history, understanding that every individual today is a part of that history, and that it is up to us to contribute our words. After the author panel, we were introduced to Pauline Ts’o as we caught glimpses of her book, Whispers of the Wolf, in various stages as it formed from an idea, into manuscripts, and onto pages filled with illustrations. Next, we were introduced to Aaron Gronstal and Dr. Lee Francis IV (Publisher of Native Comics) who both work with comic books and graphic novels. Mr. Gronstal works as the author and illustrator of the NASA Astrobiology Program’s series of graphic histories entitled, “Astrobiology: The Story of our Search for Life in the Universe”. In his afternoon breakout session Aaron taught us about the the importance of facial expression in storytelling with illustrations and he told us to create illustrations of our own showing progressive facial expressions that told a story without using text but we ran out of time (no one did it cause we were all too shy...or maybe it was just me). Dr. Lee Francis IV works with Native Realities, an indigenous publishing company specializing in comics and graphic novels (Tales of the Mighty Code Talkers, Tribal Force). Dr. Francis explained further the process of receiving manuscripts and either turning them into something more and also rejecting authors. PSA: don't approach publishers in public and expect them to accept your manuscript. Some will but most likely they'll reject your idea. A VERY IMPORTANT PSA: There is an Indigenous Comic-Con I had no idea! November 10-12 in Albuquerque, NM! Click HERE for info! World Wisdom, Inc. Press Editor Linda Hitchings handed multiple books out to people and asked us to pick a recurring theme in those books to get an understanding of what the publisher looks for when looking at manuscripts; a vital exercise to help authors realize they can't send just any book out to any publisher and expect things to work out. Irvin Morris, in his afternoon session explained the elements he uses in his own storytelling through his experience of seeing a dead horse...yup...it got pretty intense pretty fast. Our Thursday night writing exercises consisted of reading from Luci Tapahonso’s poem "I Am Singing Now". Lemanuel then told us to rid of any words and phrases we wanted to shorten our poems to little more than a few sentences to create something new. I am singing and slowly recede into blankets of dream"
I personally love seeing images flash across my eyes and I imagined every word being played out like a movie scene. The skies, the moon, the clouds were just friends that were always there for me so I let them sleep in the bed of the pickup. The exercise utilizes the erasure poem and is definitely a lot of fun to try especially when one has writer’s block. LaFrenda Frank relayed specific information on various types of manuscripts Salina Bookshelf expects when receiving children's books, young adult novels, and reference books. A huge problem of Native American literature is that books are often written and illustrated by Non-native individuals, more often than Native Americans, LaFrenda emphasized the importance of promoting authentic and genuine voices and portrayal of Native Americans in the book as she works on behalf of Salina Bookshelf. Jaclyn Roessel, president of Grownup Navajo guided us through her personally story of creating her own blog and becoming larger than she ever imagined. She also gave awesome examples such as OXDX’s creator Jared Yazzie’s TMBLWDS blog as well as Sometimes Classy, Mostly Chizhii by Carrie Wood. It's really this presentation that inspired me to write this blog in the first place so a huge thanks to Jaclyn for an awesome presentation. The last activity at the institute was an open mic that included residents of Crownpoint, volunteers of the program, and of course the writing scholars. First, we were told to write a short story using two sentences. "I felt safe for the first time waking up the next morning by the medicine man. Then I remembered he never use to have hooves for hands..."
Yii-Yah! I love scary stories and this one won me a free copy of Esther’s book From the Belly of My Beauty. The poems shared after were more powerful and revealing than any of the other exercises that took place throughout the week. Whether through free form poetry or a few freestyles from aspiring rappers, the honesty, fear, and hope were all expressed during this very intimate open mic. You just had to be there honestly, I can’t really explain it. After this super phenomenal moment of sharing, the Diné Emerging Writer’s Institute was closed with the presenters and writing scholars receiving certificates of appreciation and participation. I packed up my things, looked at the campus, took a breath and then I left. After experiencing this institute I know my favorite part was meeting the other writing scholars and hearing their backstories. To hear their experiences drip either slowly or profusely in the words they write was incredibly humbling. You can learn a lot about what bothers a person in the words they write. You also learn a lot about what keeps them writing, fighting back, breathing. I want to give forever thanks to everyone at NTU, the staff, the cooks, Lemanuel Loley and the Navajo Women’s Commision for making this possible and most enjoyable. I want to thank all the presenters and other writing scholars for offering up your words, experiences, and masterpieces of storytelling, you all will continue to inspire me. For those who are struggling to take care of your loved ones and see writing as an outlet, to those who are attending school off in New York writing the next masterpiece of a play, and those who just have always wanted to write something for yourself, keep going and I will too. The information I gathered from these individuals will live forever in my heart and mind to keep me moving forward for the past, present, and future generations of my Diné people. I learned that being a Diné writer is finding your place amongst history, knowing that what you have to say matters, and realizing that in order to share history you have to let it out of your body for it to live on. Except the last group picture taken by: Daniel W. Vandever, Thanks Daniel for an amazing book that I have had the opportunity to help promote!